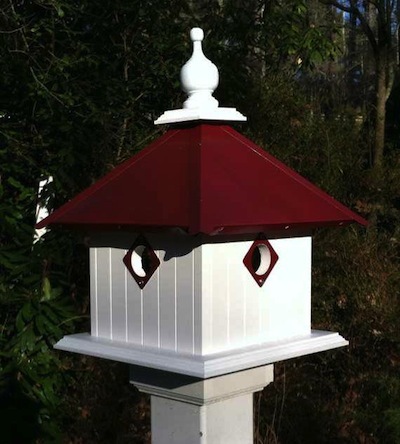 Dovecote Birdhouse for a Shiny, Top-Notch Gift! 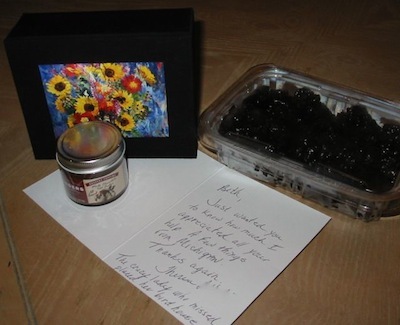 Looking for a really special gift, one that’s going to last a lifetime? 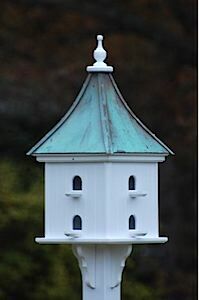 For any gardener or nature lover on your list, a dovecote birdhouse in the landscape is absolutely dreamy! Aside from the curb appeal, they help birds thrive through frigid winter weather by offering cozy roosting spots. There’s feeders too, in gazebo and large capacity styles. One will definitely see more winged activity at a feeder, but said feeder must be maintained; filled and cleaned regularly. When it comes to feeding seed, we like using sunflower hearts or a no-waste mix. These leave far less grou nd mess below feeders, and anything that does fall to the ground is quickly consumed because it’s the good stuff! Say feeders are great but there’s squirrels mucking about in the yard? No worries there! 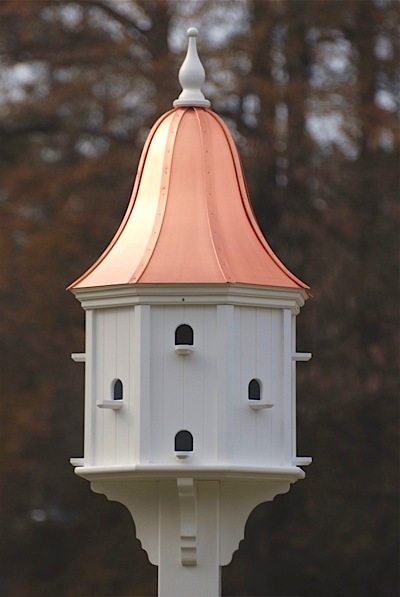 While most baffles are black or green, cone shape and possibly not too slick looking… here’s a new one especially for the vinyl dovecote houses and feeders! White, slender and unobtrusive, pesky squirrels and even raccoons are not getting passed this one! Made for a true 4×4 post, they work beautifully with the vinyl post covers. 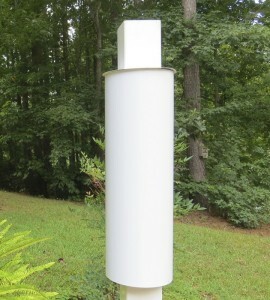 Why would anyone use a baffle on a birdhouse? Predators! Help keep eggs and nestlings safe from any critter who might shimmy on up the post as eggs are quite a tasty treat for many furry ones! 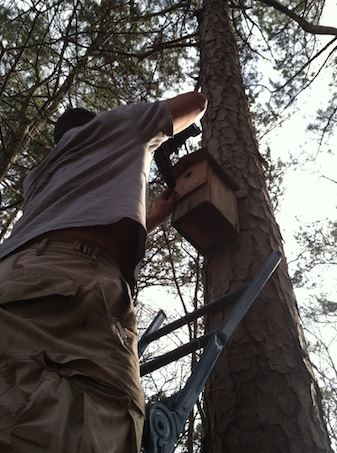 Our bluebird houses always have baffles installed to protect nests. Wild birds actually tell us about the environment. It is through Citizen Science groups like Cornell and Audubon, that changing bird ranges are tracked and documented. The cumulative information submitted by ordinary folks like you and me give scientists a true picture of the ever-changing world around us. Not just hear-say, but actual statistics that tell the real story! Should you have any doubts on this, just take a look at the scenario below, a quick video produced by Defenders of Wildlife a few years back. And should you have any doubt about giving a dovecote birdhouse this holiday season – rest assured it will be the most awesome gift ever… and they ship for free too! Because Father’s Day is on the way, we’d like to offer a few unrivaled ideas for those dads who dig birds! Looking for something special this year? 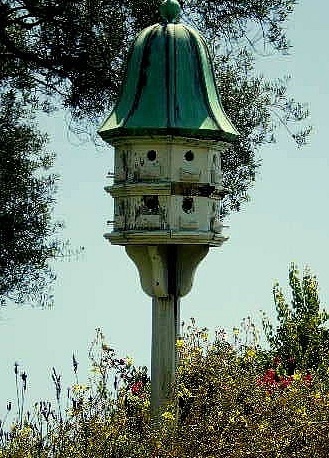 A lasting gift to bring some real enjoyment can be found in birdhouses and feeders. There’s nothing better than escaping daily chaos by connecting with nature… well, maybe a trip to the beach? Grabbing time to just sit and watch birds at a feeder does something for heart and soul, it soothes the mind and quiets the brain. Listening to birdsong also has a tranquil effect, after all, it’s been around since the dawn of time. 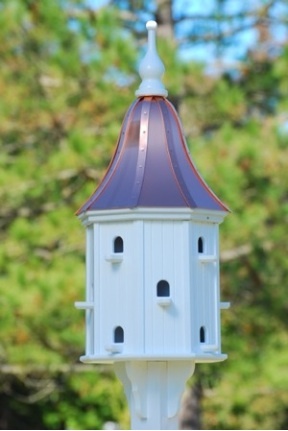 Traditional dovecote birdhouses have a new spin for sports-minded dads too! Sized from bluebird to mansion they’re available in team colors. 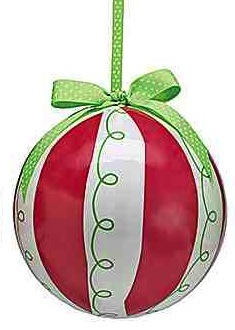 Since these are made to order, best to shake a tail feather to get it in time for Father’s Day. Monday 6/15 is last call. 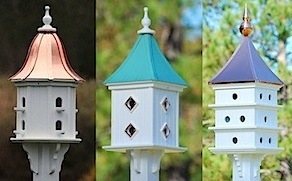 Lots of other unique gift ideas too, but remember the early bird catches the best birdhouses and feeders! 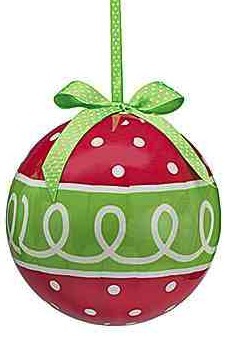 Oh yeah, the real beauty here is durable vinyl/PVC construction. 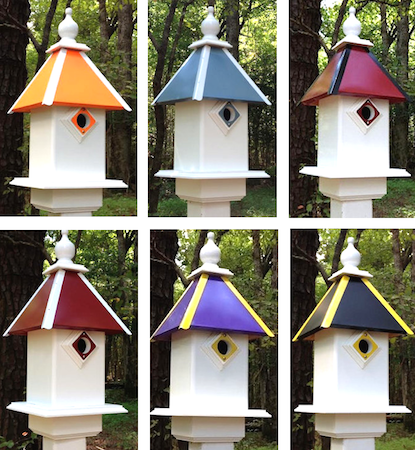 These post-mounted bird homes look like wood, but wear like vinyl siding on a real house. There’s no deterioration, no rotting or cracking. Take a garden hose to them for cleaning, they’re built to last and USA made 🙂 Do right by Dad with a gift that’s guaranteed to please him… and the birds! 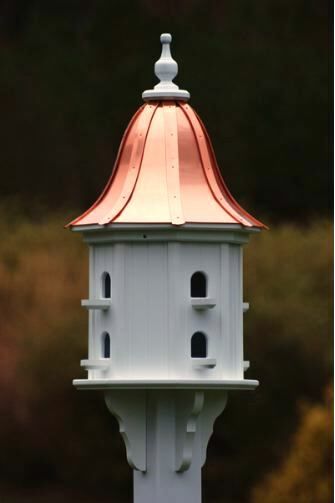 Why Go USA made on this copper roof birdhouse? In the spirit of the Labor Day holiday, we say go USA. Most times it’s true, you really do get what you pay for from a quality perspective. 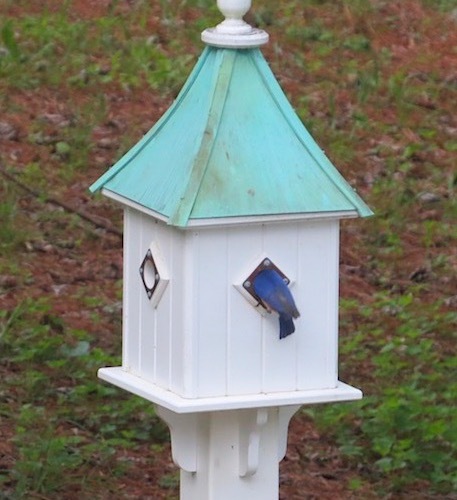 Although these two stunning birdhouses appear identical, they are not. Looks can be so deceiving! One is proudly crafted in the USA (in a mom & pop shop-supporting American jobs and our own economy) while the other is a mass produced knock-off from overseas. Can you tell the difference? Barley noticeable just by looking at the images, right? 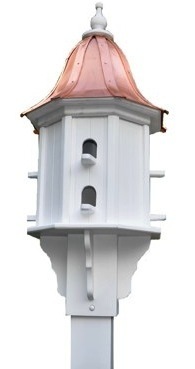 Both seem to have identical features, from the finial down to the decorative brackets… great knock-off, huh? 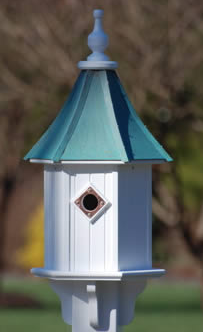 The main feature that sets this copper roof birdhouse apart is the basic material: vinyl versus wood. Bet you still can’t really see the difference! That’s because the vinyl one made in the USA is such superb quality… it looks like wood! We’ve even had a customer or two over the years call us with concerns that their order was for a vinyl house – but they received a wooden one! Sure the price tag is higher for the vinyl version, but it’s guaranteed to last because it’s impervious to weather and insects. In fact it’s even guaranteed to look new 5 or 10 years down the road! How many manufacturers can give that kind of assurance on their products? Actually very few come to our minds. The wooden house will absolutely fall prey to the elements, it may take a year or two, but down the road cracks, splits and warping are inevitable. And heaven forbid a pesky squirrel decides he likes the house enough to chew on it! We’re not knocking the wood version because it really is a great copy, it’s just a well know fact that with any wooden item left outdoors over time-Mother Nature and the elements will take their toll. Making an investment in your landscape, be it for curb appeal, the birds, or both shouldn’t cause heartache down the road. Know what you’re purchasing, where it’s made, and any guarantees that come with it… regardless of the item. 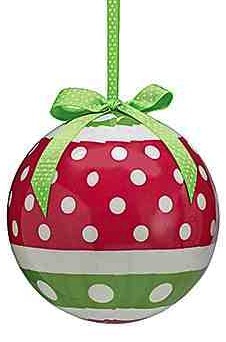 Please support USA made and keep small business in business.